Heidern (ハイデルン) is the leader of the Ikari Team (which is composed of him together with Ralf Jones and Clark Still). He is thought to be a "cold-blooded killing machine", but he also has a tragic past. In 1986 (eight years prior to The King of Fighters '94 tournament), Rugal Bernstein kidnapped Heidern's wife, Sandra, and daughter, Clara, and challenged him to try and take them back from him. Heidern had no choice but to take the bait, and he and his men directly assaulted Rugal at his Blacknoah. Rugal killed all of Heidern's men by himself, saving Heidern for last. Before Rugal could finish him off, Heidern's family intervened, and sacrificed themselves to save him. The incident left Heidern alone, and missing an eye. After that, Heidern's only mission was to get his revenge. He found Leona, as the last survivor of a destroyed village, during a mission deep in an unknown jungle. He asked her many questions, but Leona remained unresponsive. Realizing it was useless to try and ask her anything more, Heidern decided to keep her at the base for the time being, until he could send her to an orphanage. However, when Heidern came back from a mission, he saw Leona slash a tree to the ground with her hands. Surprised at this display of power, Heidern thought it would be better for the girl to stay with him and train as a soldier. Immediately, Leona began her training under Heidern's orders. She learned all of Heidern's techniques, due to her incredible ability to cut with her hands. Heidern was surprised at how much Leona progressed; she seemed predisposed towards fighting. After he had re-established his team, the Ikari Warriors, he went after Rugal to get his revenge. 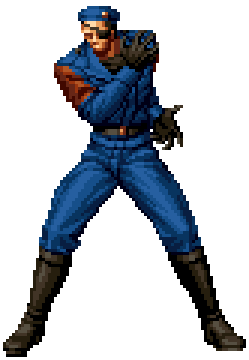 Beginning in The King of Fighters '96, he assigns Leona to take his place in the tournaments while he issues orders from the sidelines. He continues to play a major part in one of the series' subplots. This page was last edited on 18 January 2009, at 13:19.